After a week of manual labor, this old body needed a restful day of sailing. I don't think I have ever sailed into Elliott Bay from my home port of Southworth. 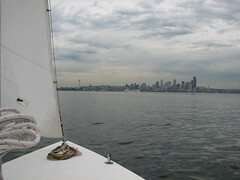 So, since I had the time for a long day sail, I ventured north to the bustling bay and got a look of the city by sail. It was an overcast sky, so everything had a grey look to it. The emerald city was still impressive. The homeward leg brought a freshening wind, so it was an exhilarating, though chilly ride home.